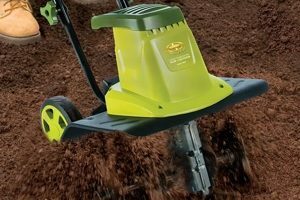 When purchasing a new weed eater blade, you’ll notice that there is a wide range of selections to choose from. Weed eater blades are categorized as either metal or plastic blades. In case you don’t know what each of these blades is best for, here is the information about each one of them. They’re mostly used in trimming grass and weeds and are used as an alternative to nylon monofilament lines for cutting light weeds and grass. However, unlike nylon lines, these blades should not be used for edging or cutting through hard surfaces. They have chisel-shaped blades which are ideal for cutting through hard surfaces. These blades are the best for cutting rough bushes, weeds and tall grasses. These blades should not be used for cutting wooden materials. The teeth should be sharpened often to ensure perfect results. There is another class of metal blades which are used for cutting through bushes and wooden materials. 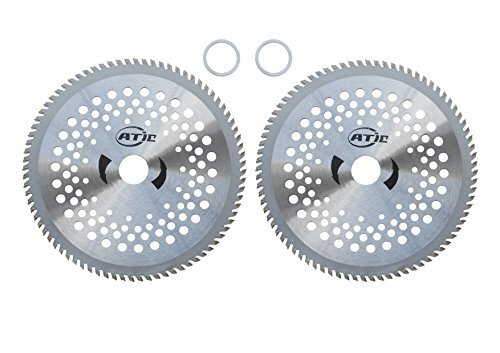 These blades have saw-like teeth which are very tough and the best for cutting shrubs, sapling and woody bushes with ease. Such blades should be sharpened effectively to promote high performance. Metal blades are more durable than plastic blades. If your trimmer is using plastic blades, avoid trimming hard bushes and tall grasses which can damage the teeth. For metal blades, avoid trimming woody bushes or other hard surfaces as they can damage the teeth. 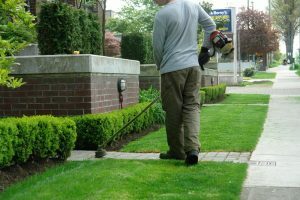 Plastic blades are more preferred for trimming landscapes as compared to metal blades. This is because these blades are softer and more “forgiving,” making it hard for them to damage your plants’ roots. 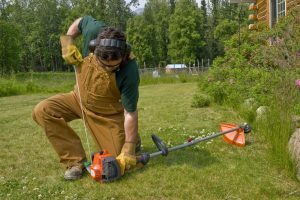 Metal blades are the best for cutting edges, trimming heavy weeds, and lining the fence. When it comes to maintenance, metal blades can be sharpened regularly to increase efficiency, while plastic blades should be replaced occasionally. Depending on your choice, you can decide to purchase the inexpensive plastic blades or buy a metal blade then sharpen it regularly. With that in mind, this article will review some of the top weed eater blades available in the market. 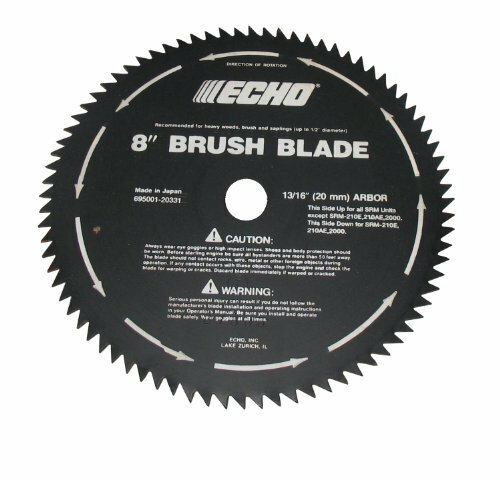 The Echo 80-Tooth Brush Blade is a metal blade which is mostly used for cutting tall bushes, small trees, saplings and reeds. It has an 8-inch diameter and 80 sharp teeth which provide a broad and powerful cutting surface. This blade is made of heavy gauge steel which resists corrosion and rust. With the ability to perform heavy duty tasks, this blade fits in most weed eater models such as the SRM-210, SRM-201i, SRM-210SB and SRM-210U, among many others. With a total of 80 teeth, this blade is capable of cutting down rough bushes and trees with ease. The price of this blade is inexpensive and highly affordable to all users. Some customers have criticized the blade stating that it dulls quickly. The blade’s diameter is too small and doesn’t fit most weed eaters. The 2 Pack 8” Brush Cutter is a universal fit blade which is capable of operating in a number of weed eaters. Made from stainless steel, this blade cutter is designed for super high RPM trimmers with a range of 10,000+ RPM. The tips of this blade are made from carbide to avoid breakage. Carbide is among the hardest and toughest alloys known. In addition to this, the cutting blades have an additional tungsten and titanium alloy for a longer lasting durability. This blade has a diameter of 8” and a maximum of 80 teeth. The package comes with two pieces and dedicated blade washers for maximum effectiveness. With a total of 80-teeth, this blade is capable of cutting down tall trees, bushes and shrubs in a fraction of time. The package comes with two blades which can be used simultaneously. The 2 Pack 8” Brush Cutter has a solid construction which is designed for tough tasks. For instance, the blade is made of steel while the tips are made of carbide, tungsten and titanium alloys. Most customers have praised the price of these blades stating that they’re very affordable. These blades are limited to high performance trimmers with sufficient horsepower enough to operate the blades. 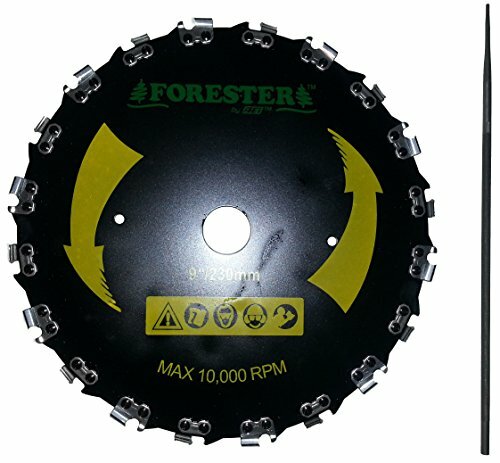 Forester Chainsaw Brush Blade is a heavy duty metal blade which is only recommended for straight shaft trimmers. Designed with a maximum speed of 10,000 RPM, this blade is ideal for heavy duty trimmers which are recommended for clearing rough bushes and tall grass. The manufacturer has included a sharpening file to sharpen all the 20 teeth with ease. Available with dimensions of 10.9×10×0.4 inches and a weight of 1.4 pounds, this blade is among the best preferred for straight shaft trimmers. This blade is designed with a tough stainless steel material which is resistant to breakage. This blade is available in most stores at a reasonable price. The teeth are very sharp making this blade the best for eating away shrubs and rough bushes. This blade is very sharp and dangerous. Users have to incur extra costs of buying protective gear. 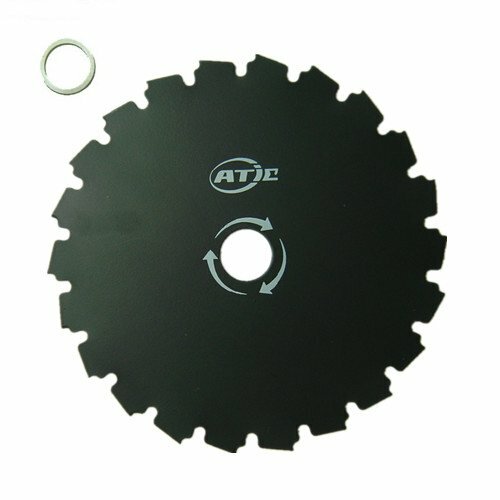 The 8” Brush Cutter Trimmer Blade is another stainless steel blade designed for high performance trimmers. Designed with 22 teeth and an 8-inch diameter, this blade is the best for gas/oil trimmers which require a lot of power to operate. Most customers who have tested this blade have praised its performance stating that it’s capable of trimming tall bushes, shrubs and trees in no time. This high performance blade cutter is made from stainless steel material which is durable and tough. The price is very fair as compared to similar blades on the market. Installing the blade in the weed eater is very fast and easy. The only problem is with the packaging where some customers have noticed small cracks between the teeth. eatingweedz.com is a participant in the Amazon Services LLC Associates Program, an affiliate advertising program designed to provide a means for sites to earn advertising fees by advertising and linking to Amazon.com. Copyright © 2019 Eating Weedz. All Rights Reserved.